Mangaluru, August 19, 2018: After days of war-level relief and rescue operations, red alert has been withdrawn for all districts of Kerala, which has been battered by incessant rain and floods. However, orange alert remains in place in 10 districts of the southern coastal state while yellow alert has been declared for two other districts. Meanwhile, the Karnataka State Road Transport Corporation (KSRTC) has also restored bus services to Ernakulam, Kottayam, Thrissur, Palghat, Kozhikode, Kannur and Trivandrum districts of Kerala. The first bus service will start from Trivandrum for Bengaluru at 4 pm on Sunday. This comes even as the Indian Meteorological Department (IMD) has forecast that heavy rains are likely in several districts of Kerala on Sunday as well. 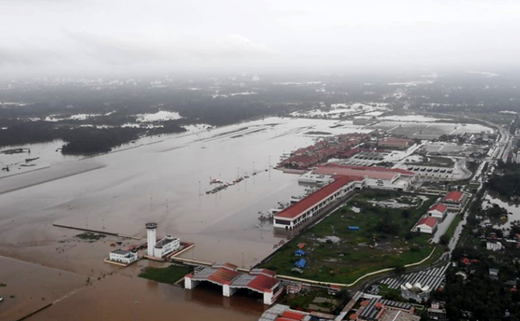 At least 368 people have died in Kerala, of which 33 lost their lives on Saturday itself. More than 58,000 people have been rescued from across the state so far. The Indian Army, Coastguards, Indian Navy and National Disaster Response Force (NDRF), among others, have been conducting rescue and relief operations across the state. Prime Minister Narendra Modi also visited Kerala to take stock of the situation. He conducted an aerial survey of the affected regions on Saturday. The Centre has also allocated Rs 500 crore additional amount to aid relief operations. Several states have also announced financial aid for the rain-battered coastal state. Over 3.53 lakh affected persons had been lodged in over 2,000 relief camps. Places which are the worst affected include Aluva, Chalakudy, Chengannur, Alappuzha and Pathanamthitta. Kerala Chief Minister Pinarayi Vijayan on Saturday said that the situation in Kerala “is very serious and grave”. “The death toll would have been higher, but for the work we did. Things are under control,” he said. The NDRF has till now rescued more than 194 people and evacuated around 10,467 from flood-hit Kerala. A total of 55 NDRF teams are engaged in the rescue and relief work.